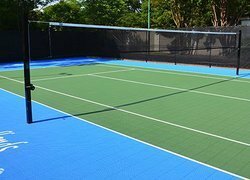 Providing you the best range of volleyball sports synthetic surface with effective & timely delivery. 1. The pattern for volleyball court flooring I offered you this time is for 2008 Beijing Paralympic Games main competition area. Please refer to the picture. 3. Special for National Table Tennis Base and Badminton Base of China. 4. Used for international and national badminton, table-tennis and volleyball matches many time.